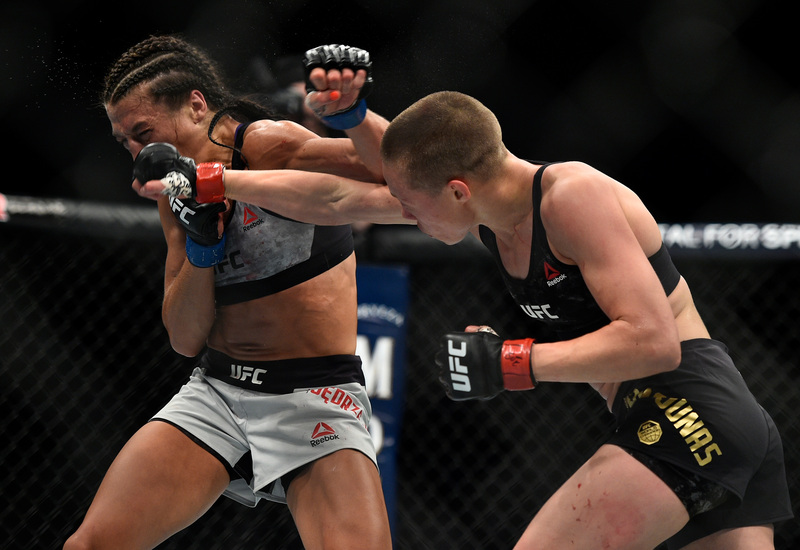 Rose Namajunas vs Joanna Jedrzejczyk UFC 223 Apr 7, 2018 (37:31) Rose Namajunas vs Joanna Jedrzejczyk UFC 223: Khabib vs Iaquinta from April 7, 2018 in Brooklyn, New York. 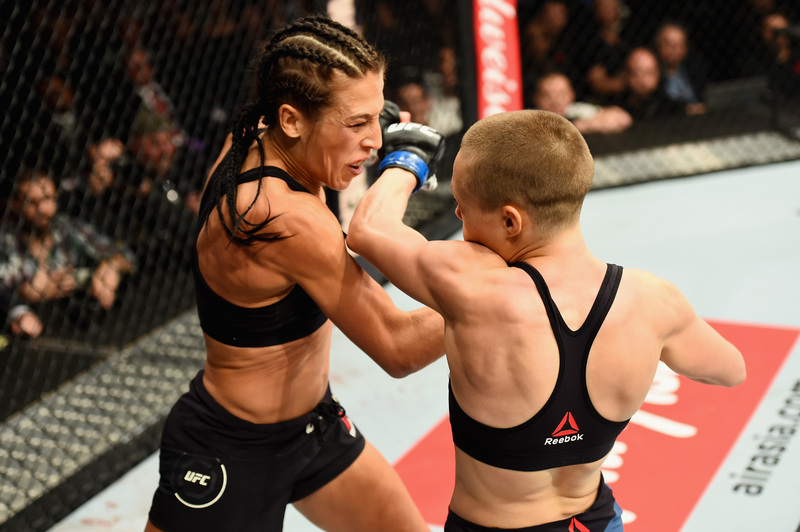 Rose Namajunas vs Joanna Jedrzejczyk UFC 217 Nov 4, 2017 (12:48) Rose Namajunas vs Joanna Jedrzejczyk UFC 217: Bisping vs St-Pierre from November 4, 2017 in New York City, New York. Rose Namajunas vs Michelle Waterson UFC Fight Night Apr 15, 2017 (17:43) Rose Namajunas vs Michelle Waterson at UFC Fight Night: Johnson vs Reis from April 15, 2017 in Kansas City, Missouri, USA. Karolina Kowalkiewicz vs Rose Namajunas UFC 201 Jul 30, 2016 (28:29) Karolina Kowalkiewicz vs Rose Namajunas at UFC 201: Lawler vs Woodley from July 30, 2016 in Atlanta, Georgia, USA. 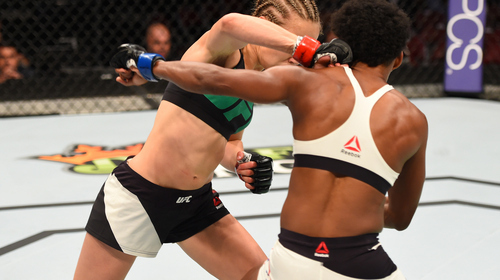 Rose Namajunas vs Tecia Torres UFC Fight Night Apr 16, 2016 (29:10) Rose Namajunas vs Tecia Torres from UFC Fight Night: Teixeira vs Evans from April 16, 2016 in Tampa, Florida. 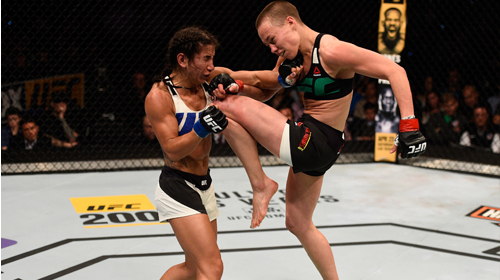 Rose Namajunas vs Paige VanZant UFC Fight Night Dec 10, 2015 (39:17) Rose Namajunas vs Paige VanZant UFC Fight Night: Namajunas vs VanZant from December 10, 2015 in Las Vegas, Nevada. 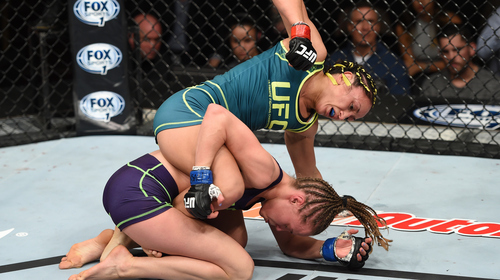 Carla Esparza vs. Rose Namajunas TUF 20 Finale Dec 12, 2014 (26:24) The first ever UFC women's strawweight champion was crowned as Carla Esparza took on Rose Namajunas at The Ultimate Fighter 20 Finale. Rose Namajunas vs Randa Markos The Ultimate Fighter 20 Dec 10, 2014 (6:17) Rose Namajunas vs Randa Markos from episode twelve of The Ultimate Fighter 20: A Champion Will Be Crowned from 2014. 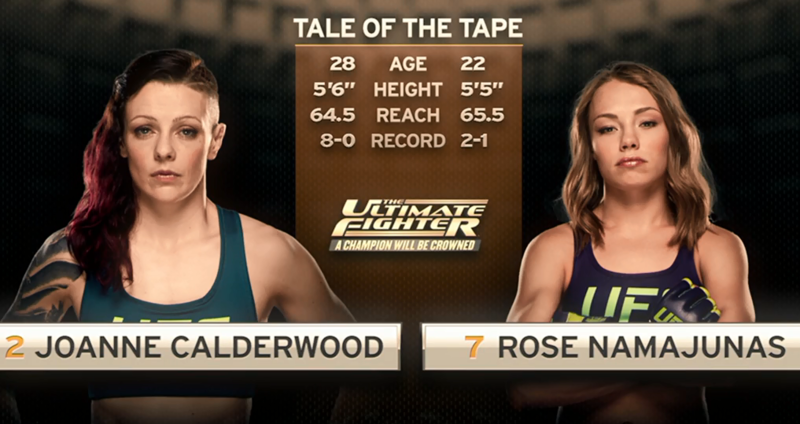 Rose Namajunas vs Joanne Calderwood The Ultimate Fighter 20 Dec 3, 2014 (11:14) Rose Namajunas vs Joanne Calderwood from episode eleven of The Ultimate Fighter 20: A Champion Will Be Crowned from 2014. 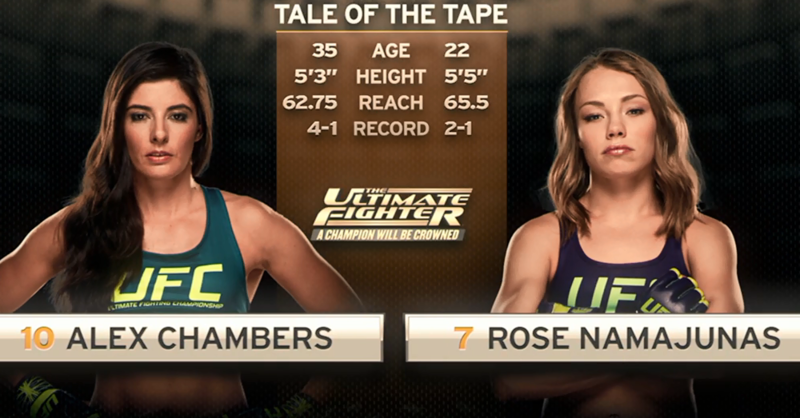 Rose Namajunas vs Alex Chambers The Ultimate Fighter 20 Nov 5, 2014 (8:34) Rose Namajunas vs Alex Chambers from episode seven of The Ultimate Fighter 20: A Champion Will Be Crowned from 2014. Tecia Torres vs. Rose Namajunas Invicta FC 6 Jul 13, 2013 (25:38) Tecia Torres made her professional debut at Invicta FC 3, earning a decision victory, but hoped to finish the fight against Rose Namajunas, a very technically sound striker who had won submission of the night honors as well. Rose Namajunas vs. Kathina Catron Invicta FC 5 Apr 5, 2013 (7:42) From Oklahoma, Kathina "Killswitch" Catrone brought a record of 2-1, with both wins via submission, to the Invicta FC cage to take on Rose Namajunas, who was coming off a successful pro debut with a submission victory at Invicta FC 4. Rose Namajunas vs. Emily Kagan Invicta FC 4 Jan 5, 2013 (23:00) The heavily-hyped pro debut of spectacular striker Rose Namajunas came at Invicta FC 4 when she faced off against the undefeated ground and pounder Emily Kagan. The winner earned a “submission of the night” bonus.